We grant funds to support organisations that focus on community participation and engagement in recreation. Targeted support will be provided for those organisations that are aiming to increase participation of people of all ages. “The senior play ground will go between the mini golf course and half basketball court, while the junior play area will go on the opposite side of the half basketball court, says Gordon Bailey, Parks and Recreation Manager (CODC). “We see this as a destination playground with different play items on offer than other spaces around Cromwell,” he says. "We are thrilled to have your support and appreciate the guidance given to our project over the last five years. Please pass on our appreciation to your Board and be assured that we will make you proud." "The Clutha Gold Trail is being greatly appreciated by the influx of users.... Our Trustees appreciate the very positive and supportive attitude of the Central Lakes Trust executive staff to the project, and their desire to be flexible enough to allow for access to the funding to get the project completed. The Clutha Gold Trustees wish to express their gratitude for your pivotal assistance with their visionary project. The Central Otago community is so fortunate to have the Central Lakes Trust." The Arrowtown Bowling Club wish to say a big thank you for the support you gave us in the replacement of our new bowling green. We have had very positive feedback from all bowlers and visitors who have had the pleasure of playing on our new green. “The men of Alexandra Men’s Shed collectively provide free or at cost assistance to a wide range of community organisations and individuals, fundraise on behalf of other charities, and coach, mentor or support individuals in a variety of practical subject areas. The vast number of projects that have the Men’s Shed behind them, and the volunteer support they provide within the community is beneficial and well received throughout our region. To ensure the group can adequately accommodate the growing waiting list of members, Alexandra Men’s Shed is building a new and larger premise. This in turn allows the men that join to give back to their community. The shed will be a community centre, a centre of excellence, and a hub for a network of in-community activities,” says Alexandra Men’s Shed Trustee, Trevor Goudie. At least 20 community groups were supported by the work of the Men’s Shed last year, just a few include; Alexandra Dunstan Lions, Omakau Church, Clyde Playcentre, Alexandra Thyme Festival. Arrowtown’s growth and lack of community facilities means the impending arrival of the much-awaited multi-use Community & Sports Centre, will be well celebrated by community groups on its scheduled completion in September 2018. At their roof shout on the 15th June, Simon Spark (pictured) acknowledged the Arrowtown Community Sports Centre located at Jack Reid Park is well underway. The centre will become a valuable resource for the growing Arrowtown community, especially as the Athenaeum community hall enters into its refurbishment phase. The sizable mixed-use facility contains rugby and scout stores, four separate smaller storage rooms for community groups, toilets, changing rooms and ablutions, kitchen and bar, as well as three interlinking community rooms that can be separate or open up into one large room, (seating approximately 150 – 160 people) and an exterior public toilet and will be a celebrated resource for many community groups. Drowning is the fourth highest cause of accidental death in New Zealand. Of the 104 drownings in New Zealand in 2017, 88 were preventable. We have had a 16% increase in drownings over the past five years. Supporting safety in and near the water by teaching our children to swim and water safety skills, sees benefit throughout the entire Central Lakes region. 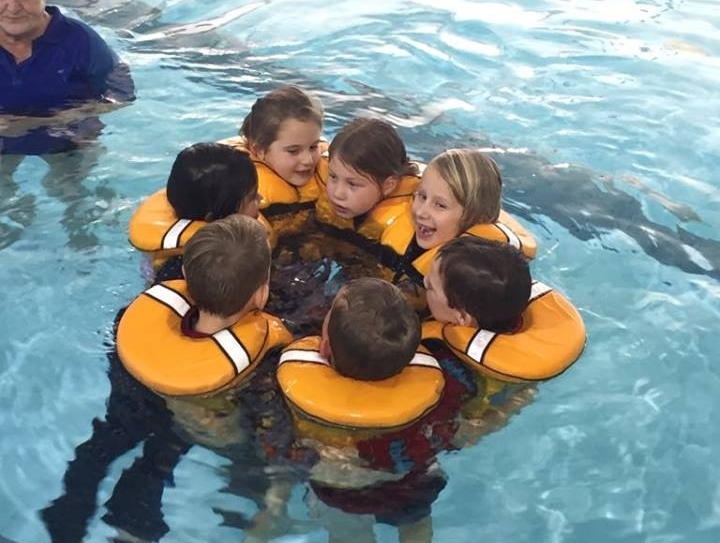 The Sport Otago swim schools programme sees all primary school children throughout the Central Lakes Trust region receive 10 swimming lessons annually. The aim is to improve each child’s confidence and ability to survive in the water, and is a joint initiative between Central Lakes Trust, Sport Otago, CODC, QLDC and the schools in the Central Lakes Trust region.